At Punchcard, we aim to transform how people use information, and that’s generally by building custom software that helps you to work harder, better, faster, and of course, stronger. Slow, poorly developed software is terribly frustrating to use, and gets in the way of people doing their job. The software we build helps makes organizations—and by direct extension, their people—be more effective. At Punchcard, we aim to build dependable, intuitive software that works with your expertise, your processes, and your people. At our roots, we’re web application developers. We’ve been building websites since the advent of Netscape Navigator. We’ve been building web applications since Microsoft .NET 1.0. We’ve built solutions on top of every version of SharePoint, and we’ve deployed tools to all types of cloud infrastructure, like Microsoft Azure. It’s not about the web browser; it’s about the web experience. More and more often, your staff is mobile. We’re expecting more of them while in the field, working with your customers and stakeholders. How we think about being productive in today’s world of work includes thinking about our smartphone and tablet usage, and thinking about when we’re connected (and when we’re not). Not only do we need to think about small screens, but we need to be thinking about large scale, too. When we build applications, our team is often thinking about how data, forms, and interfaces will need to look on a phone to a wall-mounted flat-screen television. In urban centres, we often take cellular data and wifi for granted, but for many of our clients, remote workers don’t necessarily have the advantage of a network (or a stable connection). Thinking about usage and devices enables us to build the best types of custom software, for the most amount of change. As software developers, we write code to define what our applications can do. Microsoft’s software development platform, the .NET Framework, is trusted by organizations and institutions around the world. ServiceStack is a configuration free, code-first, light-weight framework built on top of ASP.NET for building services and web applications. Frequently, our applications require robust integration and APIs to ensure data can easily move throughout the enterprise. A database standard for many enterprises, Microsoft SQL Server help accelerate mission-critical applications through proven, predictable performance, high availability, and best-of-breed security and compliance features. Data powers today’s businesses, and so we definitely understand this request. Often, we work with our clients to design and implement small, purpose-built tools, like internal databases, to collect, process, and store valuable information for your organization. The digital landscape is changing. Customers no longer have the same level of expectations as a decade ago, and the ability to provide a digital experience to your end-users is becoming more and more critical. For Buffalo Inspection Services, they approached the Punchcard team, as their trusted partner, to develop a key tool for their customers: the client extranet portal. As Canada’s largest non-union industrial and pipeline integrity testing firm, Buffalo is the leader in non-destruction examination (NDE) for oil and gas, energy, and facilities management. Working across the country, they deliver radiographic (or x-ray), ultrasonic, and other forms of testing services to some of Canada’s biggest names in the oil and gas sector. Clinically, an extranet is a website portal that can be accessed by authorized outside users, enabling an organization to present or exchange information over the internet securely. Typically, an extranet is developed to provide data or information to clients, as a value-added service. For several years, Punchcard has been Buffalo’s preferred partner for custom software development and integration services, and worked closely with Buffalo to develop Buffalo Connex, a custom reporting and job management platform, specifically geared towards supporting NDE applications and equipment. As of January 2017, the Connex platform has managed data across 1 million reporting items, and enables the finance team to easily move data from the field right into their billing and accounts receivable processes, as well as supporting Buffalo’s unique, contractor-based business model. The team at Punchcard had worked closely with Buffalo management to determine key technology and platform priorities to improve operational efficiencies. The ability for clients to access self-service functionality was high on the list of requirements. Buffalo had already invested in the development of a custom, web-based data management platform in Connex, and it just made sense to build a client access layer on top of the same technology platform. The self-service tool, or the Buffalo Extranet Portal, was a logical addition to an existing success story. While there is plenty of complexity to the extranet solution, the core implementation was supported significantly through investing in key technologies, both custom and commercially available, including Microsoft Dynamics NAV, Microsoft SQL Server, Microsoft .NET Framework, AngularJS, ServiceStack, and Microsoft Windows Server. User Experience: Core to the solution was creating an adaptive, easy-to-use user experience for both mobile and desktop devices. Accessible from anywhere—including the field—Buffalo is driving customer value by providing access to critical data on a 24-7 cycle. Dynamic Document Generation: The extranet, much like the backend Connex platform, was developed around the requirement of delivering up-to-date documents. The custom reporting engine that powers Connex is leveraged on the extranet, ensuring that every client interaction is accurate. This means that, as the business evolves, the extranet will evolve too, reducing maintenance and support costs. Desktop and Mobile Access: Both Buffalo’s technicians and their clients are everywhere, so the extranet was designed in a way to maximize platforms: in the office, in the field, or anywhere in between. Centralized Data Collection and Management: Across all the key systems, data is centralized; a core set of databases and web services help manage the workflow on both the extranet, as well as the supported functionality in Buffalo Connex. Dynamic Security Model: Understandably, security is a critical component to how the system works. Buffalo’s customers are international, and building an intelligent model to enable access to only appropriate documents was absolutely critical to the implementation of the solution. Powerful Search-driven Navigation: With thousands of documents available to any client, navigating data could have been a major issue. However, behind the scenes, the Punchcard team developed a powerful search engine, indexing millions of records, and providing lightning-fast access to all facets of the reporting platform. The portal gives Buffalo clients instant-access to reports and documents. As work is completed, reports are automatically published to the web portal, ensuring that the latest versions are in the hands of their customers. The portal reduces workload on internal staff. 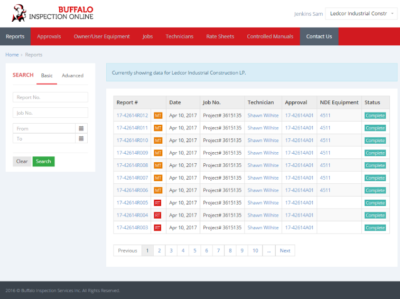 As more and more Buffalo clients rely on the extranet as a tool to do their work, internal team members should spend time answering basic, data retrieval questions specifically oriented around auditing and adherence to industrial code. The portal shows Buffalo’s commitment to innovation and technology. Without doubt, the portal also demonstrates to customers that the Buffalo team is comfortable with adaptation, and is looking for additional ways to drive value to the bottom line. Does your organization want to harness the power of data, workflow, process, and analytics? Let’s talk about how we can work with your people.